Minford’s Matthew Harris competed at the state cross country meet in Hebron, Ohio. 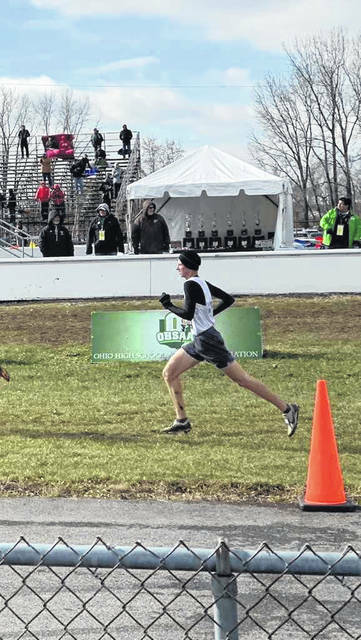 On a cold and frigid morning in Hebron, Ohio near Columbus, the two qualifiers for the state cross country races, Matthew Harris of Minford and Aiden Kammler of Portsmouth, competed in the respective fields in an experience neither will likely soon forget. In both runners first appearance at the state cross country meet, Harris finished in 110th place out of 181 runners with a time of 18:11.1 in the Division III boys’ race, and Kammler finished 71st among 178 runners with a time of 17:37.5 in the Division II boys’ race. The state competitions were originally scheduled to occur a week prior on Saturday, November 3rd, but due to the flooding conditions on the course at Hebron, the OHSAA was forced to postpone the races to the following Saturday, the 10th. For Harris and Kammler, the week long delay threw a bit of a wrench into their preparation process. For both of Scioto County’s qualifiers for the state competitions, there are plenty of thanks to go around for helping them improve as runners along the way. Both Harris and Kammler hope to be able to run in college after their graduation in the spring.